I tried this recipe based on the photo that accompanied it! 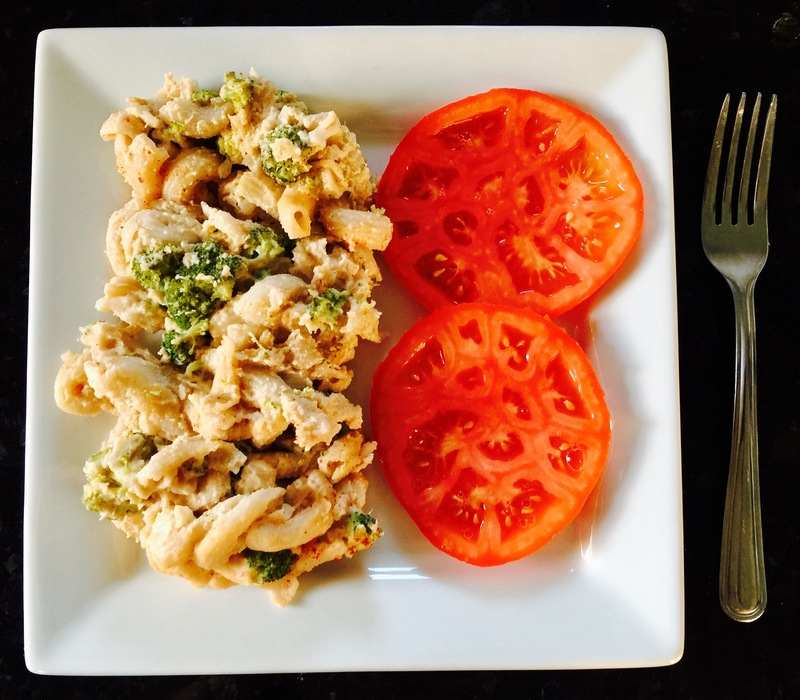 Offered on Anthony William’s website and Facebook page this healthy version of mac & cheese appealed to me. Comfort food provides just that…comfort. However, most comfort food is packed with ingredients such as dairy products, gluten and added sugar that are unhealthy for the body. What an ideal recipe for me that combines healthy ingredients to create an upgrade on an old favorite. This was such a warm and satisfying meal! 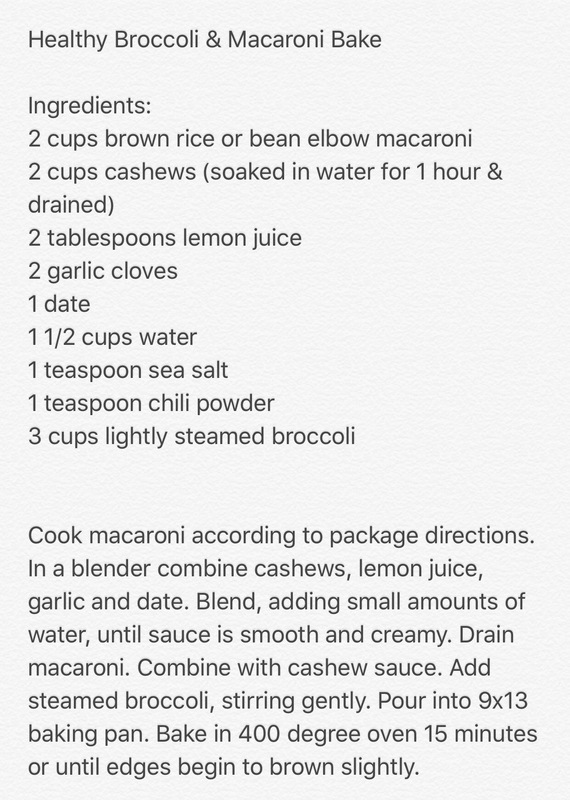 I have used cashews often as the base for sauces and dressings and you really don’t taste the nutty flavor. I am amazed everytime, by how creamy and yummy the sauce or dressing is, using cashews. This blend was so tasty that I think it would make an excellent dressing or dip for veggies. Does this dish taste exactly like regular macaroni and cheese? No, it does not have a traditional cheesy flavor. Does it taste great? Yes! The dish is creamy and hearty and makes an ample amount, providing leftovers for another meal. 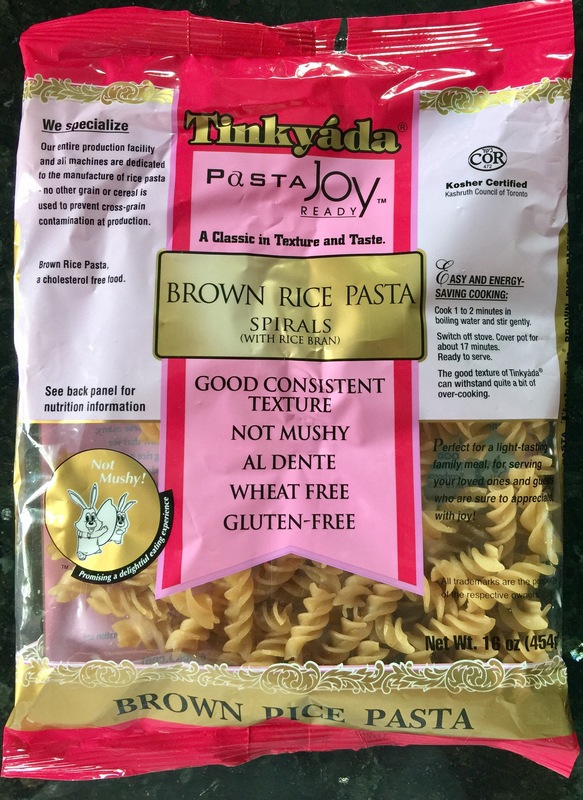 I used brown rice pasta, which is gluten free. (Pictured below, except for this recipe I used elbow macaroni.) And I sprinkled paprika on top after the casserole baked. I love good food that is in turn, good for me. When I say that I follow a plant based lifestyle, people assume I only eat salads! Not true. In fact, I rarely eat a lettuce salad. I savor a wide variety of dishes and foods, that all happen to be plant based. I firmly believe that nothing tastes as good as healthy feels. That belief enables me to pass up foods that I used to eat that contributed to my poor health and my aches and pains. How wonderful it is to discover that eating healthy doesn’t mean I sacrifice on taste and satisfaction. 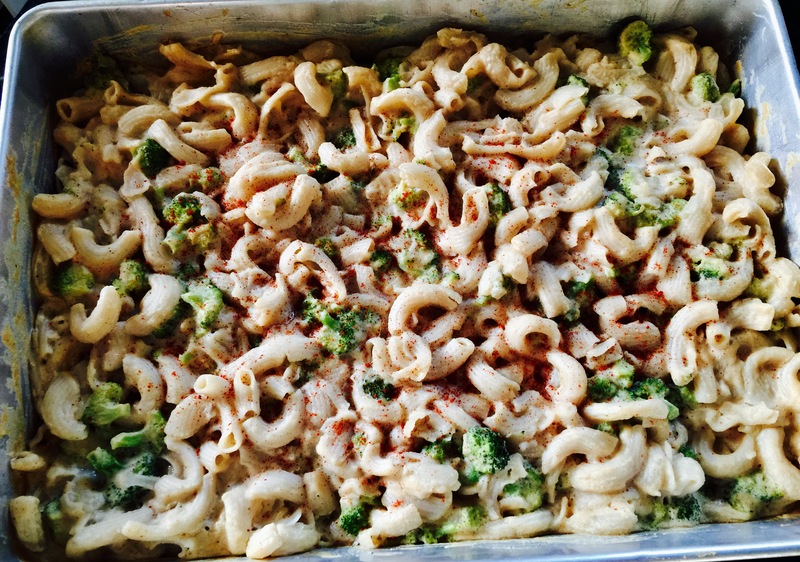 The broccoli and macaroni bake will become a new favorite! 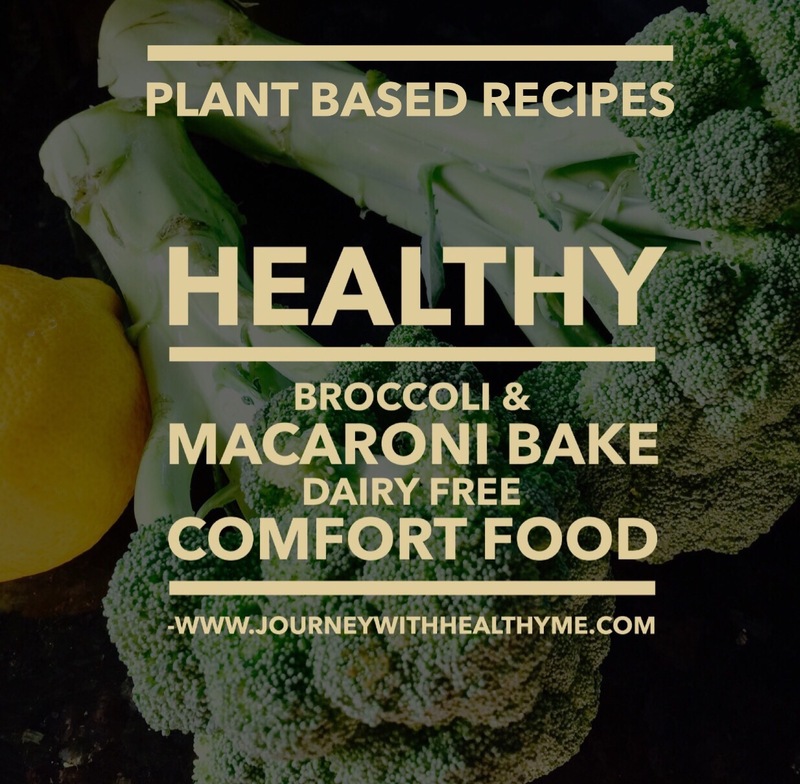 I’m sharing my favorite plant based recipe tonight. This flavorful but not too spicy curry is the perfect make ahead meal that simmers in the crockpot all day. The tantalizing aroma makes me smile in anticipation! 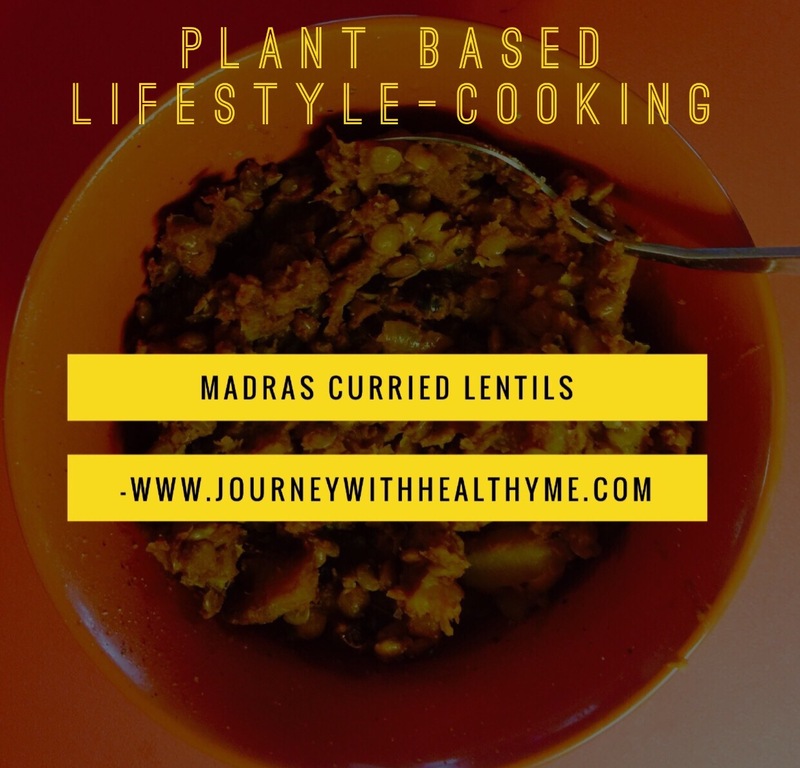 Lentils, with 25 grams of protein per cup, are great for plant based diets. 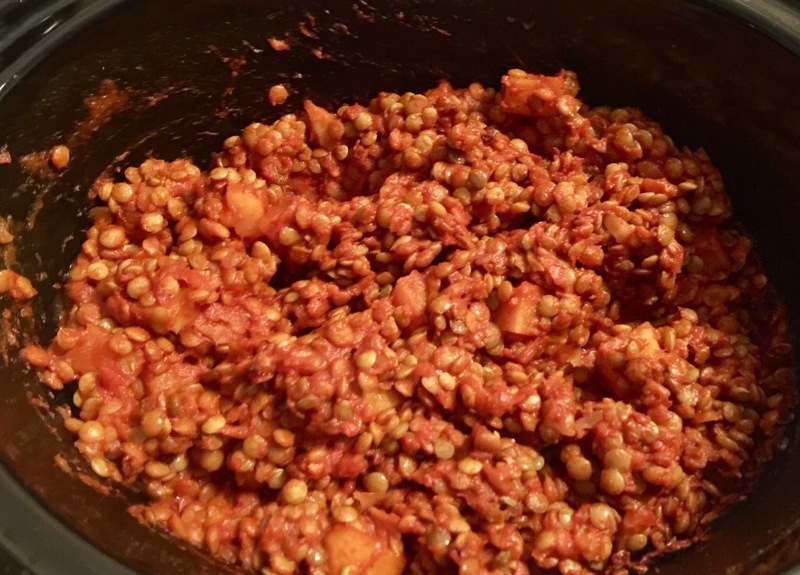 Inexpensive and easy to prepare, lentils have become one of my staples. This easy to prepare dish mixes in the crockpot in minutes. 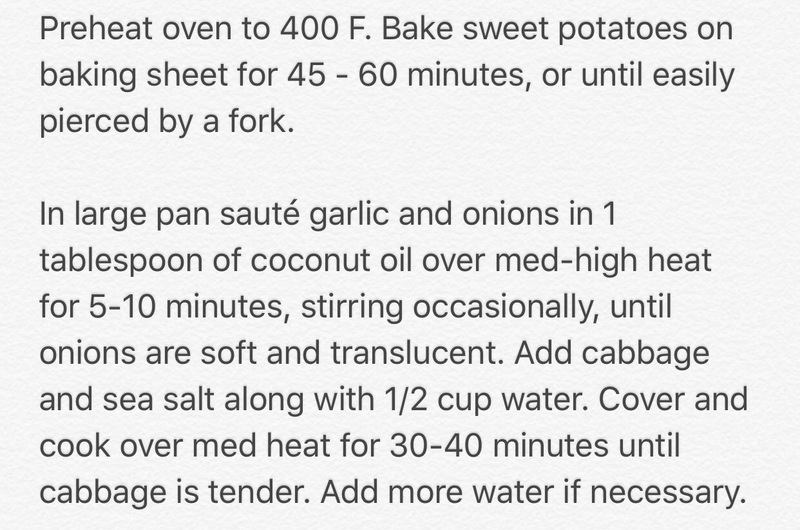 From Easy Vegetarian Slow Cooker Cookbook. Pair with brown rice or a green salad. 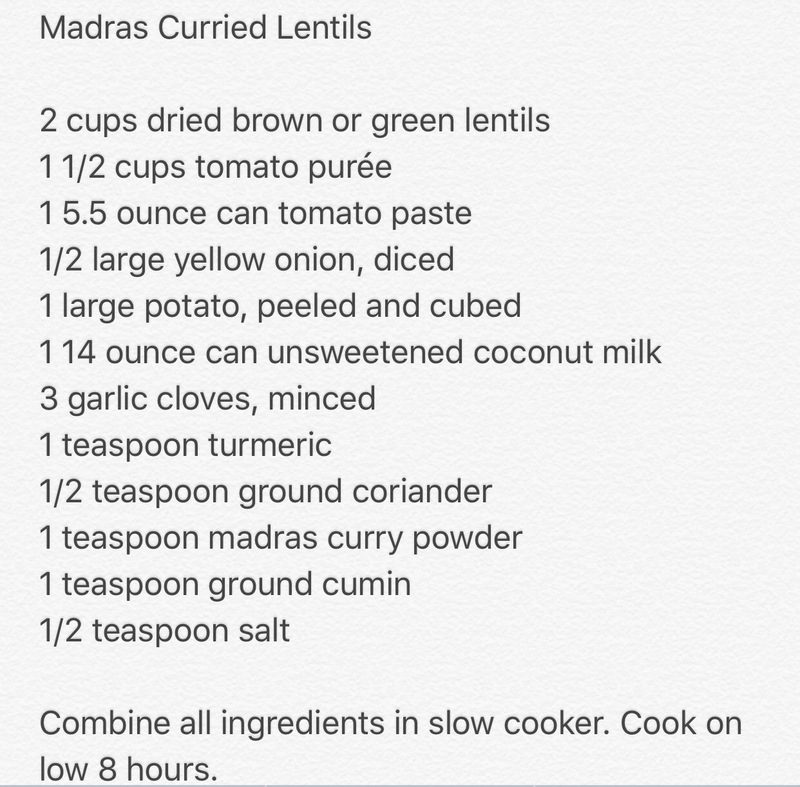 Or do as I do…fill a bowl with this tasty curry and grab a spoon…nothing else needed. Enjoy! After a week of juicing, I was ready to return today to my usual plant based way of eating. I had my customary morning fare that included celery juice and a breakfast smoothie. As lunch time approached, I prepared to break my liquid fast. I was going to eat a fruit salad. However my on hand supply of fruit was low. Taking stock of what I had available, I chose to try a simple recipe from Anthony William’s book, Life Changing Foods, that featured sweet potatoes. I was eating lunch alone so I adapted the recipe by cutting the ingredients down. 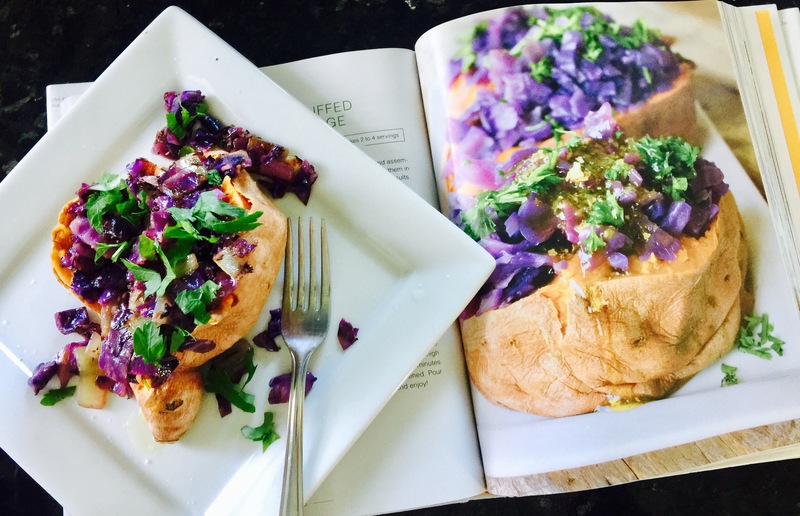 I used one sweet potato, 1/4 onion and 1/4 of a red cabbage. I made the sauce as directed. 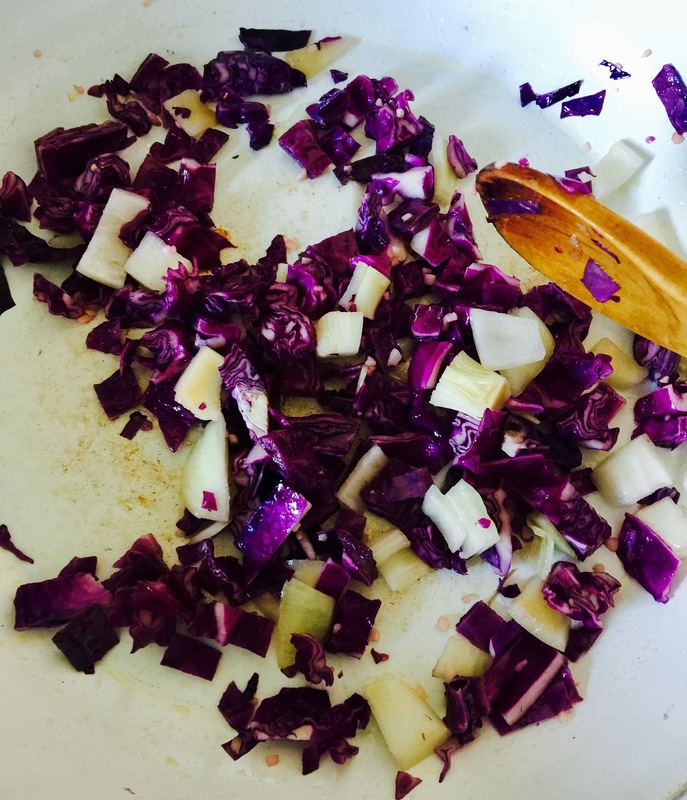 With the smaller amounts, I simply stir fried the cabbage along with the onion and garlic, rather than braising. The red cabbage made a gorgeous stir fry! 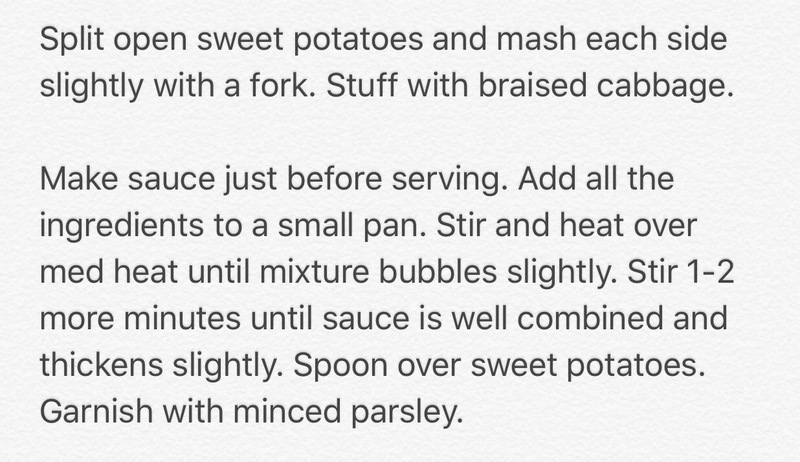 When the sweet potato was done, I prepared the sauce while keeping the stir fry warm on the stove. I was out of lemons so I substituted a lime. The sauce was wonderful…sweet without using honey, and a bit tangy from the citrus and ginger. I garnished my meal with fresh parsley. 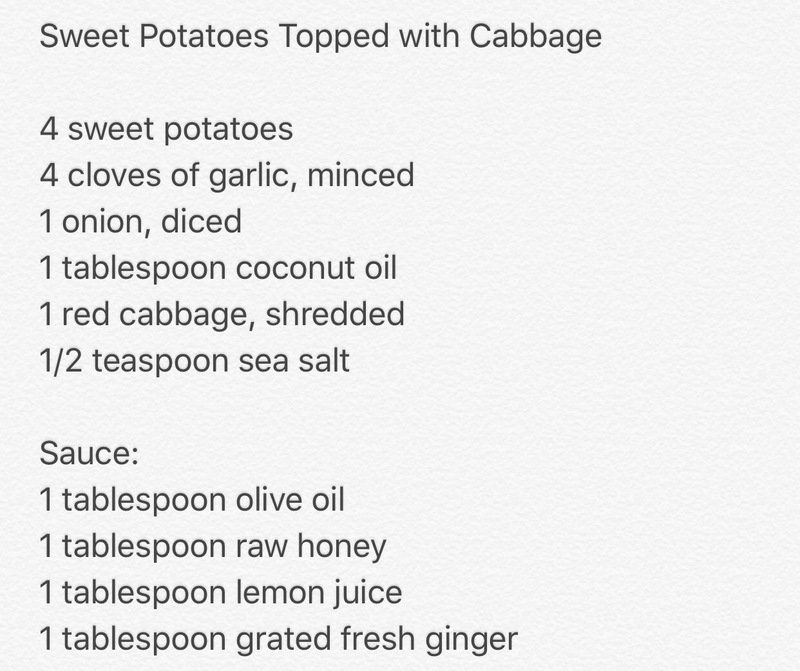 The sweet potato is a powerful food. It promotes productive bacteria in the stomach and gut while starving out unproductive bacteria and fungus. Sweet potatoes enhance the body’s production of B12. Rich in vitamins and minerals, this superfood helps alleviate narrowing of the intestinal tract due to chronic inflammation. 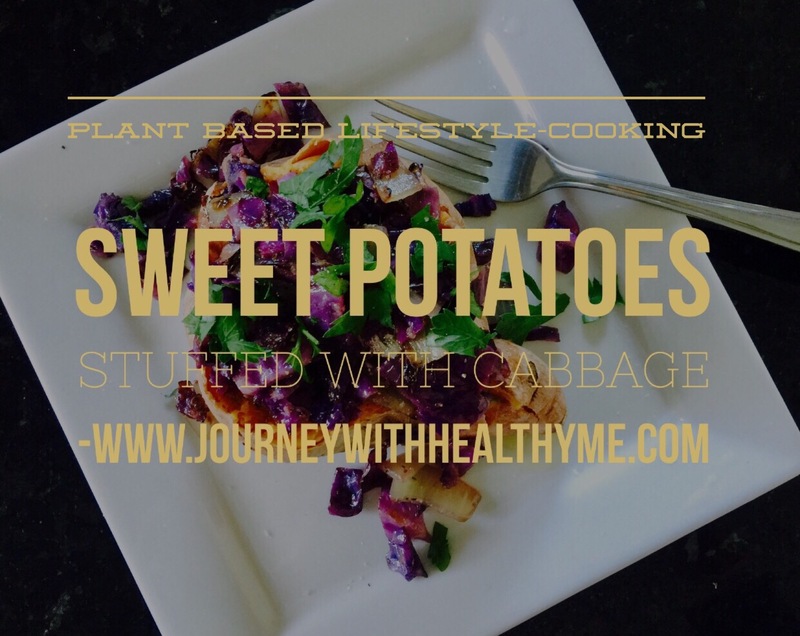 In addition, sweet potatoes help protect against a multitude of cancers. This colorful meal felt celebratory, and indeed it was, making it an excellent first meal after a week of drinking my nutrition. It was so delicious. I ate slowly, savoring each bite, and enjoying the combination of flavors. I will be making this recipe again. Welcome back to eating, Me! 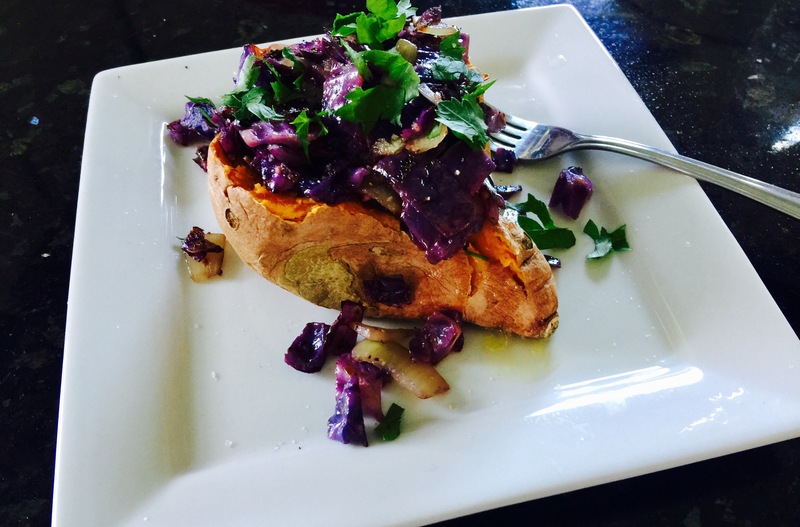 Find out the other benefts sweet potatoes provide, in Life Changing Foods by Anthony William. There are 49 other health boosting foods included in the book.